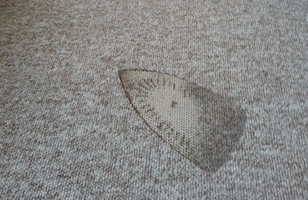 Before you consider replacing an entire carpet for the sake of a burn or scorch mark left behind by an iron – think again. 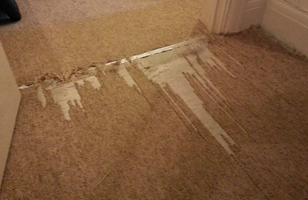 You can get a carpet burn repair carried out quite cheaply compared to the cost of carpet replacement. Deep burns such as those caused by cigarette or cigar ends dropped on to the carpet will require a patch, if of course you can find suitable material. You may have the odd piece left from the original installation lying loafing around in the garage or loft, but don’t hold your breath. Carpet replacement for the sake of a couple of burns or scorch marks is an extremely expensive process. Not for good reason do insurance companies have ‘get out clauses’ written in to many of their home and contents policies. Scorch and burn marks are a common occurrence and more so than the average person might believe. Chances are if you try to claim for a carpet on a home contents insurance policy, you may find it is one of the exemptions and isn’t eligible for a claim. You can of course try to make a repair yourself, but would you try to repair the body work of the family car if you had a small shunt or scraped a post with the side of the car? Of course not; you would take it to a car body repair shop to have a professional repair and paint job carried out. You know the job will be guaranteed and the car will come back looking brand spanking new. And that is exactly what our team of professionals is able to offer. 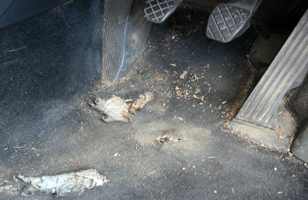 Additionally, you wouldn’t replace the entire car for the sake of a few dents and scratches on the body work, and the same would be true of minor damages to carpets. We can make a carpet burn repair easily, effectively and efficiently because we have the knowledge and the tools to make a seamless repair. For over thirty years we have been in the business of supplying, fitting and repairing soft floor coverings in residential homes and commercial premises. We have over three decades and more supplied and fitted, as well as repaired enough carpet to stretch from here to the moon and back – probably. It certainly seems that way, and we will carry on the tradition we have established over the years long into the future. Complete customer satisfaction is our goal and we deliver on promise. No job is too big or too small and we guarantee all the work which we carry out, regardless of where the floor covering is in use.